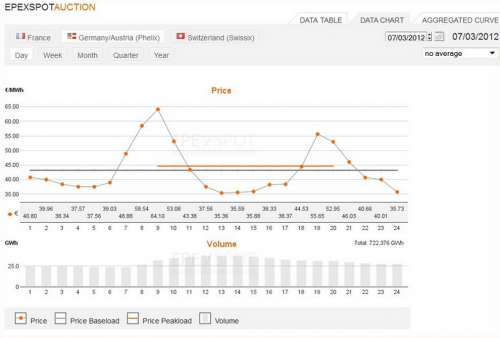 US Solar Market Insight Archives - Solar Love! 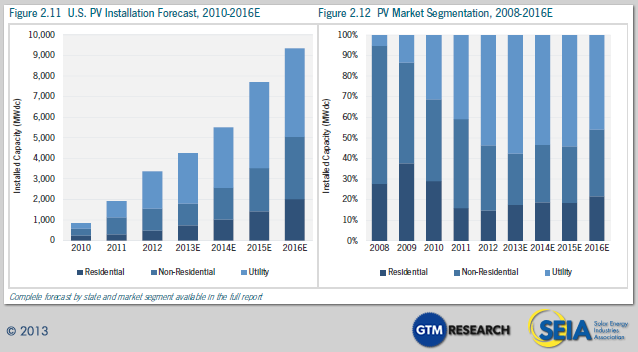 Home Tags Posts tagged with "US Solar Market Insight"
The latest US Solar Market Insight report from GTM Research and the Solar Energy Industries Association (SEIA) was published today, revealing that 2016 blew all expectations away. 2015 itself had been a record-breaking year, with the US solar market installing 7.5 gigawatts (GW) of new solar capacity. But 2016 almost doubled that total, growing 95% in one year to install a total of 14,625 megawatts (MW), and becoming the leading source of new electric generating capacity installed through the year, with 39% of new capacity across all fields. In fact, it was a great year for US renewables, with solar accounting for 39% of all new electric generating capacity during the year, and wind accounting for 26%. 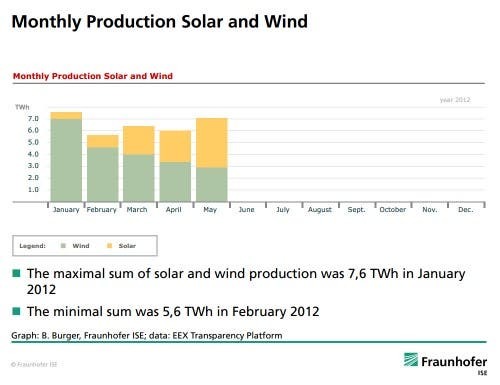 Overall this should come as no surprise, given just how impressive the third quarter was for US solar. 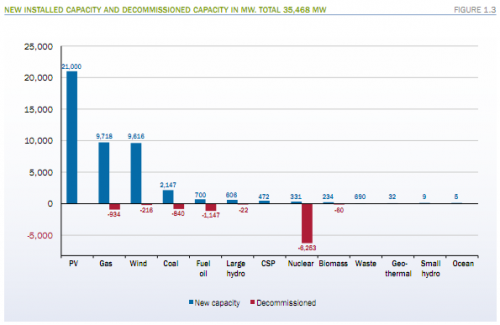 The SEIA published figures back in December which showed that not only did the third quarter see a total of 4.1 GW installed, but that the fourth quarter was expected to be even higher. 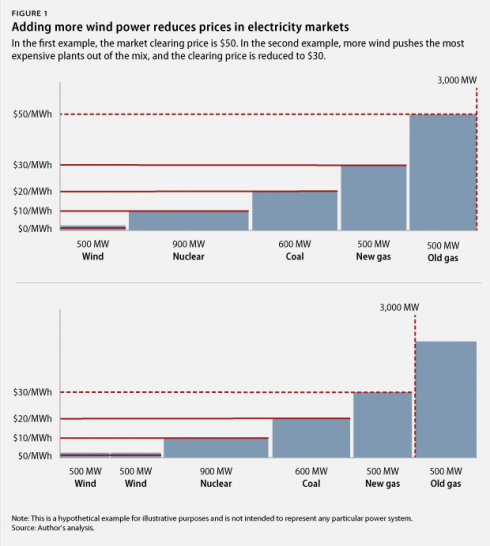 At the time, GTM Research predicted that 4.8 GW would be brought online in the fourth quarter. 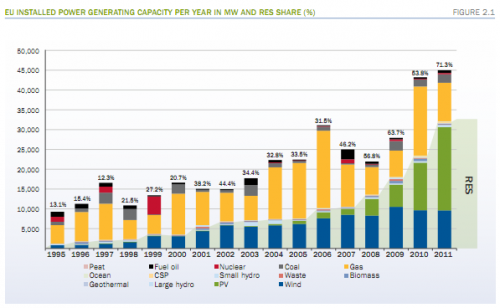 SEIA and GTM Research have done a great job in recent years of projecting US solar power growth. They know the industry. In the latest US Solar Market Insight™ report from the two (published today), we have the most up-to-date solar power growth forecast and info on the current solar PV pipeline. I’ll run down those topics quickly here. This follows previous coverage of US solar PV price trends and 3rd quarter installations. 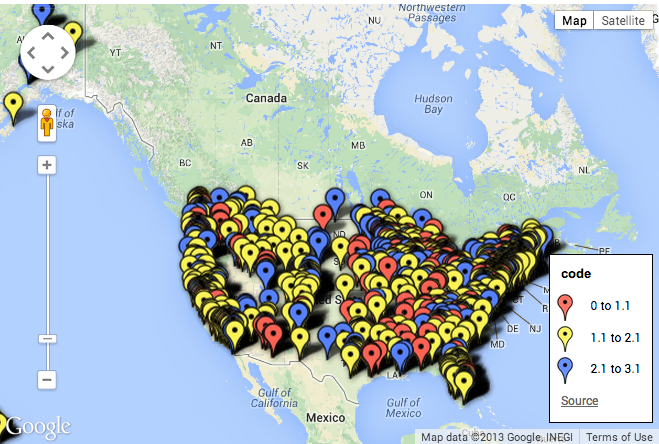 First of all, below is a projection for how much solar will be installed in each state in 2014. Of course, most of the data is in, but this includes an estimate for the 4th quarter. 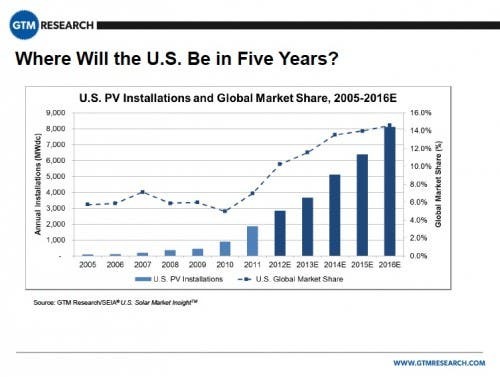 These next two show new annual solar installation capacity in the US split by residential, non-residential, and utility installation, starting in 2010 and then moving from history into projections for the future up to 2016. 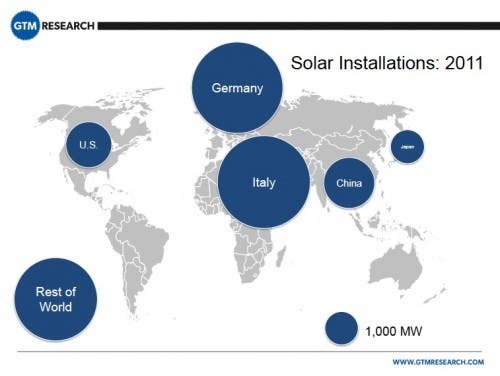 A lot of solar power growth is on the horizon! For more, check out Josh’s more comprehensive US solar installation rundown, SEIA’s full summary, the entire report if it’s in your budget, and my piece on US solar prices and price trends. 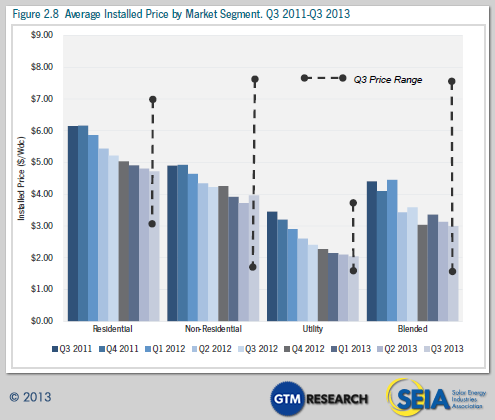 The SEIA/GTM Research US Solar Market Insight™ report for the 3rd quarter was released today. 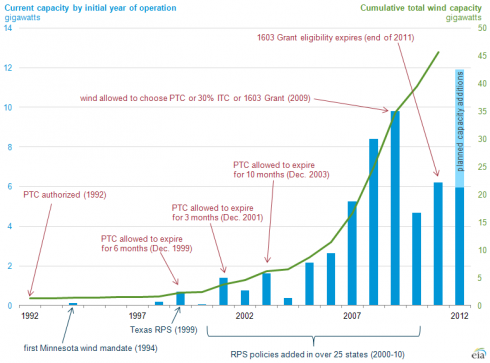 Over on CleanTechnica, Josh covered the continued growth of the US solar power market. In this article, I want to quickly run down the pricing side of things. 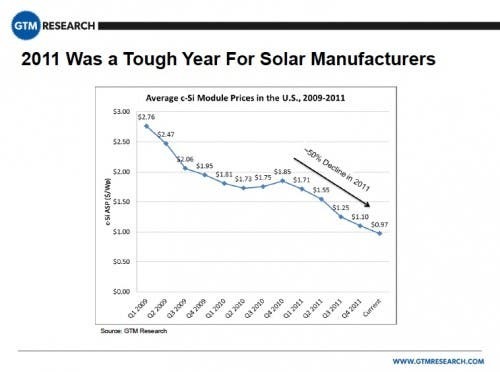 The short story is that solar prices continue to fall in the US. More specifically, starting with residential solar PV systems, the average total installed cost of a rooftop solar PV system in the 3rd quarter of 2014 was down to $3.60/watt, 14 cents per watt lower than in the 2nd quarter, and 23 cents per watt lower than in the 1st quarter. “Best-in-class installers are achieving lower costs by leaning on high installation volumes that allow the purchase of hardware directly from manufacturers and by amortizing overhead costs over a larger installation base,” SEIA adds. Bringing down those soft costs has been a strong focus of the US Department of Energy and a number of solar startups, as well as the large solar players. I imagine we’ll keep seeing a gradual decline in those costs, but it would be nice if we somehow made a quick jump down. Unfortunately, with the distributed nature of solar permitting and the overall US solar market, I don’t think there’s a silver-bullet way to get to Germany’s or Australia’s soft cost level. Market maturity is what’s needed, and all of what that entails. Non-residential solar prices also continued to decline in the 3rd quarter. On a flat roof, a the price of a non-residential solar PV system is down to $2.27 per watt according to the report. The low they found for the 3rd quarter was $1.55/Wdc, while the high was $2.10/Wdc. Of course, with all of these solar power systems, the price per watt doesn’t provide the full picture when it comes to cost-competitiveness. The solar resources in the area of the project, the solar incentives, the quality and efficiency of the solar PV systems, the price of competing electricity sources, and other factors provide the estimated levelized cost of electricity (LCOE) and how it compares to the competition. The actual $/kilowatt-hour is what’s really going to matter to the customer. Pricing for polysilicon and PV components fell quarter-over-quarter in the third quarter of 2014. Polysilicon price adjustments were slight as polysilicon demand remained strong, prices falling only 1% sequentially to $21.70/kg. In contrast, demand for wafers fell during the quarter, driving prices down 4% to $0.22/Wdc. However, the most dramatic drop was the decline in Taiwanese cell spot prices. Following the U.S. imposition of antidumping duties on Taiwanese cells and modules, Taiwanese cell spot prices plummeted from $0.44/Wdc in Q2 to $0.34/Wdc in Q3. Since duties spanned from 20.86% to 27.59%, final prices in the U.S. hovered around $0.41/Wdc in Q3. Module pricing in the U.S. differs widely based on order volume, producer region and individual firm. During the third quarter, delivered prices for Chinese modules ranged from $0.72/Wdc on the low side (corresponding to order volumes greater than 10 MWdc for less established firms) to $0.75/W on the high side (established, bankable firms, order volumes of less than 1 MWdc). Blended delivered pricing for Chinese modules is estimated to have stayed flat at $0.73/W for the third straight quarter, up 4% from Q3 last year. Pricing by firms in the U.S. and other Asian countries (Korea, Malaysia, Singapore) selling into the residential and commercial sector were in the range of low to mid $0.80/Wdc, largely in sync with price levels throughout the year. For more, check out Josh’s US solar installation rundown, SEIA’s full summary, the entire report if it’s in your budget, and our upcoming piece on the US solar PV pipeline and leading solar states. Find out in about 60 seconds! 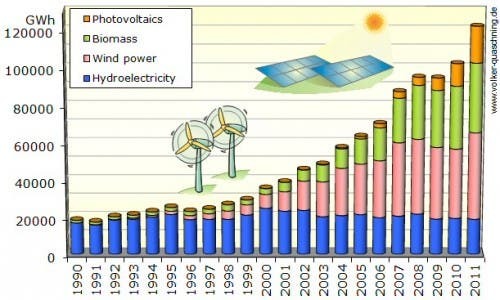 I’m sure that a number of our visitors contributed to the new solar power records set in the US in the third quarter. Happy we’re part of the rooftop revolution! So, what are the three records to which I’m referring? According to GTM Research and the Solar Energy Industries Association (SEIA), solar panels were installed on more US residential rooftops in the third quarter of 2013 than in any previous quarter in history. Furthermore, the total solar power capacity of residential solar installations set a new record of 186 MW. Thirdly, on average, this growth was fueled by the cheapest solar panels yet. In total, solar panels are now installed in over 400,000 locations in the US, totaling 10,250 megawatts (MW) of installed power capacity. To put that into human terms, we have enough solar power installed to provide electricity to over 1.7 million average American homes. The 930 MW of solar power capacity installed in the third quarter was a full 35% higher than the capacity installed in the third quarter of 2012. As amazing as all that is, much more is projected for the US in the coming years, and this quarter (the fourth quarter) is projected to add even more solar power capacity than was added last quarter. 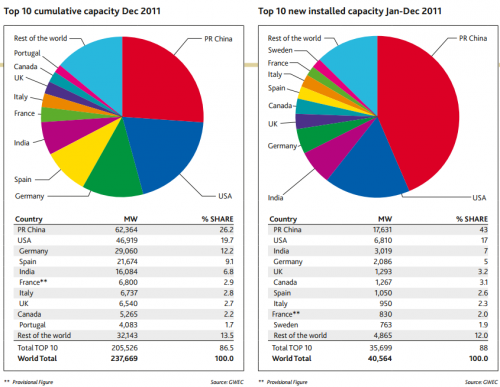 If the report’s projections are correct, the US will install over 5,000 MW of solar power capacity this year. That would be 27% more than last year! For 2013 as a whole, new solar power capacity is expected to be enough to power up to 850,000 average American homes. 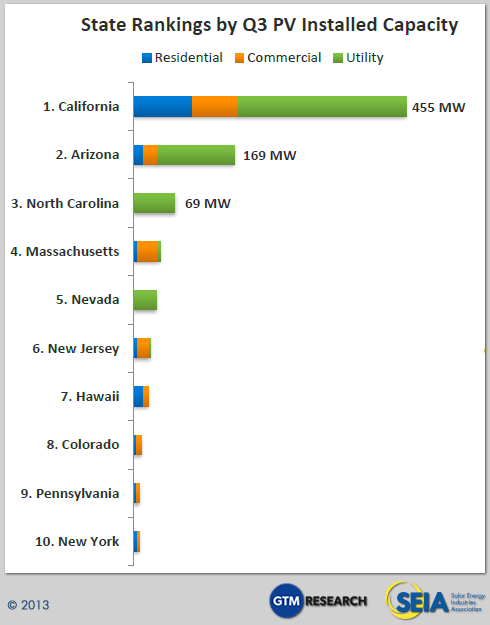 The top 5 states for solar power capacity added in Q3 2013 were California, Arizona, North Carolina, Massachusetts, and Nevada. 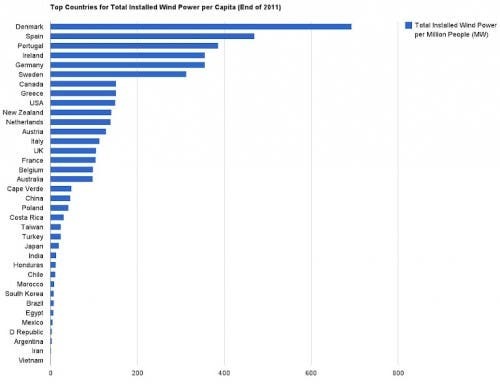 However, you can see in the chart below that the leading states for residential solar were California, Hawaii, and Arizona — with a handful of Northeastern states following. All of that is awesome in itself, but also note that one of the huge benefits of this solar power growth is job growth across the US. If you head over there and then zoom in, you’ll get a better vision of the staggering number of solar companies that are doing business in the US — from manufacturers to installers to large-scale solar developers. 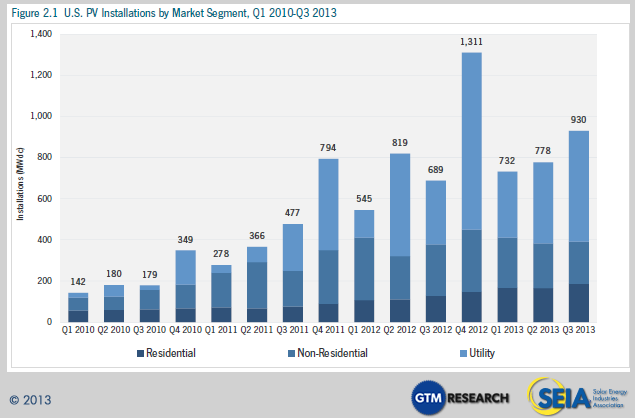 Will you join the solar rooftop revolution in this record quarter? For more information on the latest US solar power trends, check out the US Solar Market Insight: Q3 2013 report. All images via SEIA, with credit to GTM Research and SEIA.